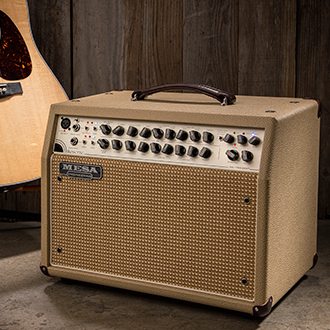 Capture Your Acoustic’s Tone with Detail and Clarity Like Never Before. Introducing the new Rosette® Acoustic DI Preamplifier for home, studio or stage. The new Rosette® Acoustic DI Preamplifier starts with the Front End and EQ circuitry found in our Rosette 300® Two:Eight Combo and adds even more pro-features. Dedicated to acoustic instruments, you'll find the addition of a high-end Notch Filter along with another valuable performance feature - a variable, footswitchable Boost. When we turned our eyes and ears toward amplifying acoustic sounds, one thing more than any other stood out as an objective; Do No Harm. In its sincerity and perfection, there is no reason to “enhance” the sound of the acoustic guitar, or any other acoustic instrument for that matter, but rather… just reproduce it. Introducing the Rosette® DI, an Acoustic Instrument Direct Interface that puts accurate reproduction at the top of the list, and yet, also offers comprehensive shaping power for enhancement when you might need it. 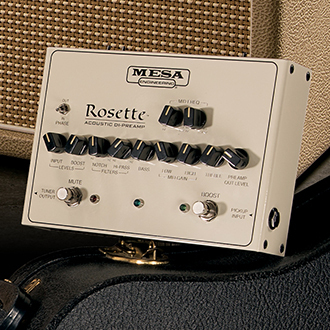 We start with the same Front End and EQ circuitry used in our Rosette® 300 Two:Eight Combo, minus the Mic Input. Both products’ circuit design is derived from high end recording console design. This no-compromise approach ensures the purest signal path and lowest noise specs while at the same time insuring detailed, rich musicality and unrivaled accuracy. The Rosette® DI, Acoustic DI Preamplifier utilizes the same Front End and EQ circuitry found in our Rosette 300® Two:Eight Combo, minus the Mic input, derived from high end Recording Console design. As you would expect on any pro console, both Input Gain and Phase are addressed in the INPUT control and PHASE switch. A wide range of high impedance pickups are handled easily with the optimized, current source-biased FET input stage. The Phase relation between pickup output and whatever speakers are being driven can be addressed by flipping the PHASE switch on the Rosette DI for easy comparison to decrease or eliminate feedback or even improve your overall tone. From there we’ve included two additional sweep-able Filters to assist with feedback elimination in the live performance environment. NOTCH FILTER cuts a chosen frequency in a narrow band to remove resonant frequencies that cause feedback. This Filter removes those frequencies as it is rotated clockwise. The HI-PASS is also a Filter that cuts frequencies in the sub-harmonic range as it is turned clock-wise. This is very helpful in both eliminating unwanted low frequency feedback on stage as well as tightening up the low-end for specific instruments or musical styles. A footswitchable BOOST is incorporated for increasing the level of certain musical sections like solos or anyplace a level increase is needed. The BOOST LEVEL sets the amount of BOOST when the BOOST switch is engaged. Additionally a footswitchable MUTE is also included which mutes the signal at the Rear Panel outputs but does not mute the side TUNER Output, enabling you to employ silent tuning between songs. The fully professional EQ Section incorporates fixed shelving BASS and TREBLE controls plus two semi-parametric MID bands covering LOW and HIGH midrange frequencies. These can overlap for finite control over adjacent midrange frequencies or one might be used to combat feedback while the other is applied for Tone shaping duties. Experience the new Rosette DI Preamp. The result of 48 years of definitive amp design and a focus to deliver the most accurate reproduction of your instrument’s acoustic sound possible in amplification. Visit FULL DETAILS for more information and the Rosette Acoustic Di Preamplifier format page for a complete list of technical specifications. The first thing you’ll likely notice on the Rosette™ DI Rear Panel are the two XLR Balanced Outputs flanking the others, which are ¼” phono jacks. These allow the choice of capturing the straight sound of your instrument or the sound of the preamp’s effect on the source. Both XLR Balanced and ¼” Phono PREAMP OUTPUTS are provided to capture the sound of the entire preamp for a feed to either the Stage’s Monitor Board, a Recording Console, power amp or powered Monitors for larger Stage rig applications. The XLR PREAMP Output is Balanced while the ¼” PREAMP Output is Unbalanced. Both of these Outputs are optimized for LINE Level. An XLR Balanced DIRECT OUTPUT is provided that allows a choice of origination points for the signal, which is determined by the SOURCE switch. PRE and POST are options and they are described below under SOURCE. This Output is optimized for MIC Level Input applications making it the obvious choice for a feed to the Front Of House Console or for Recording scenarios where you might want an unaffected source for later shaping and/or processing. Either of these OUTPUTS may be used for the most appropriate destination or they may both be used simultaneously for different destinations, the most common of these scenarios being the DIRECT Output feeding the Front Of House Console and the PREAMP Output feeding the Monitor Console for further reinforcement of your Stage sound. The XLR DIRECT OUTPUT allows you to choose between PRE, which captures the signal just after the INPUT buffer stage but before the GAIN control and 4-Band EQ, and POST, which captures the signal after the preamp and EQ section. Regardless of which location the signal is derived from, the OUTPUT will be MIC Level (-30dB -10dB). Both Balanced OUTPUTS include GROUND LIFT switches that allow the lifting of PIN 1 on the XLR to help eliminate the possibility of different Ground references causing unwanted noise or hum. A Series Effects Loop is provided for interfacing outboard processing and this appears as two ¼” phono jacks labeled SEND, where the signal is taken at the end of the preamp, and RETURN, where it is returned, buffered and passed on to the output stage and then to the MASTER. The Loop is likely best for time-based effects such as Chorus, Flange and Delay. Since fewer effects like overdrive, compression, envelope filters and wah are used with Acoustic Instruments, the need to put devices in front of the ROSETTE DI will likely be infrequent, but should you find yourself using these types of effects, place them there in the signal path. The internal Battery can be bypassed to run the ROSETTE on standard voltage wall power. Simply connect the Power Supply to the jack and the internal battery will be disconnected automatically. However, the DI Preamp can be easily powered from any 9VDC power supply and draws less than 45mA so it’s very pedalboard friendly.